If we live until we're 80, we have 4160 Tuesdays. That's all. Let's not waste them. 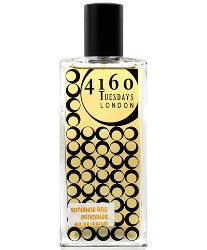 I've waited too long to try some fragrances from 4160Tuesdays. That's strange, because I've been a fan of Sarah McCartney since she was LUSH's copywriter and head of brand publications (seriously, I still own some tattered circa-2003 issues of the "LUSH TIMES") and I'm drawn to independent fragrance houses that combine humor with a poetic sensibility. One reason: 4160Tuesdays isn't available in any brick-and-mortar shops in New York. Another: the brand's explanation of its name makes me feel a bit nervous and sad (and mortal). This summer, I've finally seized the day and ordered a few samples of 4160Tuesday scents. My first pick, just because of its name, was Sunshine and Pancakes. 4160Tuesdays describes this one as "a British 'oriental' — warm skin at the end of a day at the beach, with honey and lemon pancakes." Sunshine and Pancakes has notes of lemon, orange, sandalwood, rosewood, jasmine, vanilla, honey, musk and benzoin. Even though some of those notes sound pretty rich, it's a bright and buoyant perfume. The citrus top notes are well-blended with the honey (real honey absolute!) from the very first moment, and the jasmine (also natural) is airy and clean. 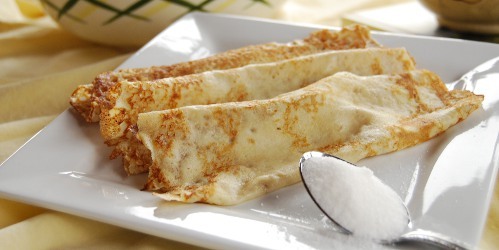 The "pancakes" here are English-style pancakes, which are thinner than American pancakes and served with lemon wedges and sugar rather than butter and maple syrup. But this isn't a typical gourmand fragrance: its honey and vanilla are transparent (and unisex) and they're balanced by the sheer musk and something that almost suggests fresh garden dirt to my nose. Sunshine and Pancakes is quirky yet wearable, and it's unusual; it doesn't remind me of anything else I've ever tried. La Via del Profumo Tasneem, a soft ylang-ylang oriental, is the closest I can come with a comparison from my own sample collection. In any case, I wore Sunshine and Pancakes to a summer brunch date with some friends last weekend, and it was just perfect for the occasion. Centrepiece's name comes from the initial reaction it inspired: "When we all sat around the lab benches sniffing it it gave us a gentle feeling of peace, of finding our calm centre in a busy world. So it became Centrepiece." This is another oriental, with a composition of honey, green tea, vanilla, frangipani, cedar and musk. Despite some shared notes, it feels plusher and denser than Sunshine and Pancakes. I get just a hint of the fresh, citrusy green tea before the vanilla and creamy white floral and woods emerge, and I keep thinking I smell sandalwood and benzoin, and even a little patchouli, although they're not officially listed in the composition. The white floral, on the other hand, turns out to be less prominent than I would have guessed from the description and list of notes. Centrepiece has superior staying power on my skin, so I have a chance to sniff it throughout a long workday, admiring the dry down's smooth mix of woods and vanilla (with a hint of chocolate?). This fragrance could appeal to fans of orientals from the classic Shalimar to the newcomer Aroma M Vanilla Hinoki. It's somewhat rich, but I was able to wear it on a hot day without feeling suffocated; it's a gourmand-leaning oriental, but it doesn't read as "dessert." I'll definitely drain my samples of both fragrances, and I'm looking forward to trying and reviewing my other samples over the coming weeks. Stay tuned, and yes, make the most of every day until then! 4160Tuesdays Sunshine And Pancakes is available as 50 ml ($90) Eau de Parfum, and Centrepiece is available as 50 ml ($110) Eau de Parfum. For purchasing information, see the listing for 4160Tuesdays under Perfume Houses. Note: top image is British Style Pancakes 1 [cropped] by LearningLark at flickr; some rights reserved. These sound lovely. Onto the list they go! Thank you for the detailed review Jessica. Did you order the samples from their website? Hello! They don’t ship directly to the US — but IndieScents and Luckyscent both carry the line and offer samples! Luckyscent has got some of the 4160tuesdays scents on sale, including Sunshine and Pancakes. I have my eye on Sunshine… eek! Whoops, my mistake. It’s just sold out, that’s all. Thank you for reviewing these Jessica! I have Centrepiece and it does make me feel centred and is gorgeous in winter- very honey dipped but not heavy. Now will have to try the pancake one, it sounds good and the idea of lemon and sugar pancakes is so incredibly special. It made me feel sort of gorgeous, too! It feels old-fashioned but it’s still wearable — honey dipped but not heavy, like you wrote! I like 4160 Tuesdays. Some of those perfume names are quite genius too! Their New York 1955 is one I reach for quite often. I actually have a little craving for Crêpe Suzette after your review. I have a sample of New York 1955 and I’m really looking forward to spraying it on!! I really like the sound of Sunshine and Pancakes! Plus that picture is making me so hungry. There are so many gems in Sarah McCartney’s line, but my favorite (actually in my all-time top10) is the Centrepiece EXTRAIT! Thick and lush and dripping with honey. Absolutely gorgeous. Often you can order directly from the company, as long as it’s 30 ml. or less, and she does do some 30 ml. bottles. It just takes a bit longer because they like to put a bunch of USA orders together to ship in one box to their US agent. Ah, that’s an interesting clarification! I find the website a bit tricky to navigate. I need to re-read the fine print! Gah — those pancakes! I wasn’t aware of this line at all; looking forward to future reviews (and, er, the samples that just climbed into my Luckyscent cart…). Hahha, yes! I’m so glad that we can get our hands on samples — and I can’t wait to try the others in my little cello bag! Thanks for the reviews! I do love honey so these definitely piqued my interest. I haven’t sampled any of her line yet, but hope to soon. It’s really a line that feels like it was created out of genuine passion and creativity, rather than an “oh, I shall have a perfume brand created in my name, because it’s cool and I can make some money” sort of thing! Pancakes with lemon juice (usually Jif lemon, preferably from the plastic lemon-shaped squeezy bottle) and caster sugar are part of my childhood in Ireland, and still hard to beat as a pancake topping. Wow — I need to try that one now! I love French crepes with butter and lemon juice and a bit of powdered sugar, and we have a few places in NYC that serve good French crepes — but now I want to sample the English and Irish variety. The picture reminds of Crepe Suzette as well. The best ones I’ve had were from an unassuming corner restaurant in Old Montreal. The best lemon pancakes are the Lemon Ricotta pancakes from Cheesecake Factory! I don’t go often because I tend to overeat and eat things like fried mac n cheese. As to 4160Tuesdays, I’ve tried the Sexiest Scent on the Planet (or something like that) and liked it and Urara’s Cafe which smelled like stale wet ashtray (yuck). I think I have Sunshine and Pancakes and will give it a test drive. Centerpiece sounds really good as well…will need to procure a sample. Thanks for the reviews! Probably the same thing that makes Auphorie Miyako smell like a moldy basement (or a conference center with carpets which had seen too many dirty shoes, tracked in dirt from rolling luggages and cigarette smoke from years past) instead of glorious osmanthus, jasmine etc. Centrepiece sounds so good. I’ve tried four or so from this line so far and have had a lot of trouble with something in the base totally taking over and overwhelming all the other notes. I’m not sure what it is but it’s made them practically unwearable for me, which really bums me out because some of the faint notes I was able to smell aside from the basenotes were really nice. Usually I’m not sensitive to any aroma chemicals or additives at all and can sample just about anything, not that I like everything I try, but this is the first time I had to do the scrubbing it off thing because of something in the base rather than just because I didn’t like the scent in general. I’m trying not to give up and will keep trying to find one that works since I do love the idea behind the line and their sense of humor and fun. Oh no! but sometimes that just happens, right? There have been a few lines that I just don’t like on myself, even when I work through the offerings from A to Z. I might even like the way some of the scents smell on friends, but just not on myself. I was very close to buying a bottle of Sunshine and Pancakes while I had the chance to get it on sale — now, I can probably put it off for a while longer. Alas.